I have one more Valentine project to share with you. 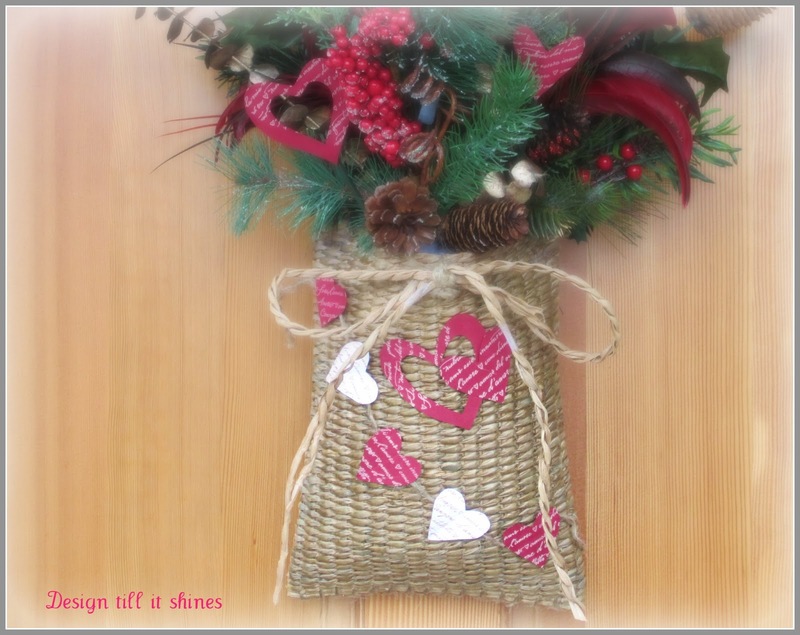 I updated my door basket from Christmas and turned it into a Valentine display. This basket has been on our front door since Christmas and looks a bit weathered, but I left it as is and just added some Valentine hearts. I think it looks kind of like a FTD bouquet wannabe but I still like it. This is how it looked at Christmas. We have a small overhang on the front, but it rains here so much that the basket does look a little roughed up compared to before. I wanted to repurpose it for Valentine's day. 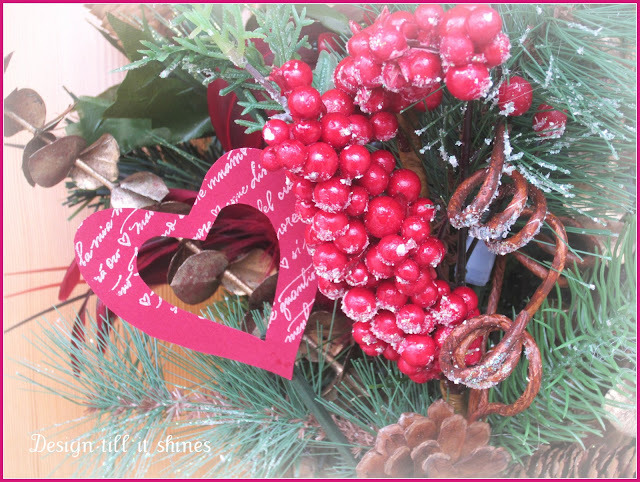 I cut out a few hearts and stamped them with my french script stamp. I made a small banner for the front and added some heart picks to the rest of the basket. I thought the Christmas and Valentine picks worked well together. The bow was made from a strip of the basket. I like the contrast of the white and the red hearts. This was so easy to put together. Everything was already done, all I had to add were the hearts. I love a quick project. Red hearts and berries go well together. Hubs thought it looked really cute too. I love the little white hearts as well. So now I have a red Valentine door and pink hearts on my mantel. Wishing you a sweet Valentine's day! 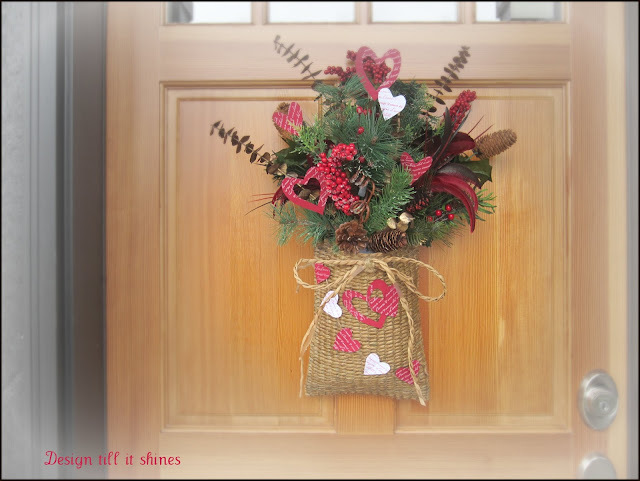 Love your basket on the front door...looks great all decked out for Valentines Day tomorrow!! Thanks so much Cindy. I appreciate you stopping by! Well, this just turned out adorable! I love the fact that you repurposed a Chrismtas item instead of going out and buying something new! Perfect! Thank you for sharing with us at TTF and Happy Valentine's Day! I love to repurpose when I can, there is only so much decor that you can find space for. Thanks for the sweet comments! Diane, Your Valentine basket is sooo cute! Thanks for sharing it at the Open House party and I am a new follower. On my way to browse your archives. Nice of you to stop by and comment. I appreciate you following me as well! Thanks so much for stopping by. Your blog post was so lovely and thanks for following back! Diane, what a wonderful idea! 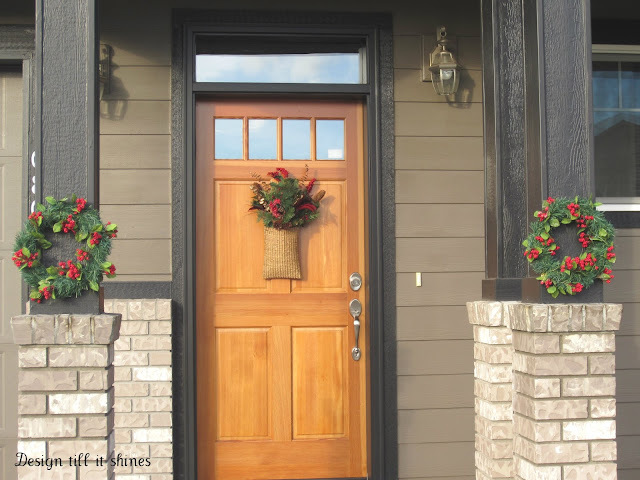 Love your front door basket! I almost didn't get it done in time for Valentine's day. Thanks for stopping by! Fabulous! I love the way you went from Christmas to Valentine's with just a little tweaking. So clever. Thanks so much for sharing with us. Thanks so much. I really enjoyed putting it together! Thanks so much for sharing this wonderful idea at Simple & Sweet Fridays. I love the cut out valentine hearts, so cute! Have a wonderful week! Both your mantel and your door basket are so pretty, Diane. 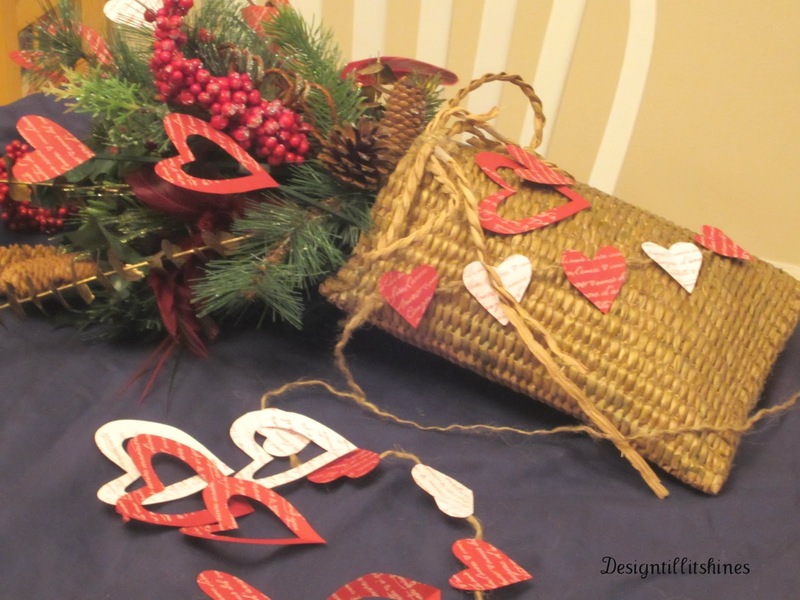 It was so clever to redo your Christmas basket into a Valentine one. So happy you are following, and I'm now following back! Thanks for the nice comments, Carol. I appreciate you following back! I just love your sweet door basket and how you've Valentined it up! Now you'll have to Spring it up too. Your entry to your home is so lovely. Thanks so much for popping in to see me. I love it!! It may look weathered to you, but to me it looks perfect! 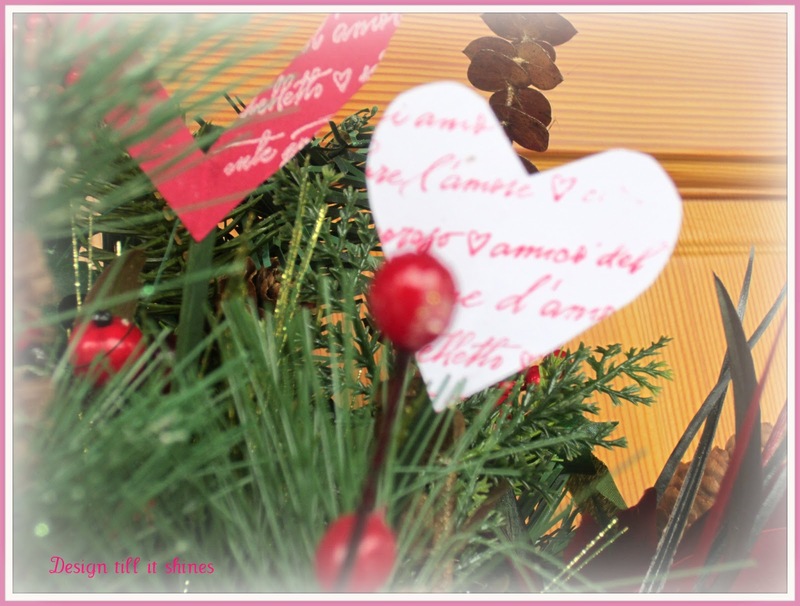 And I love a simple and fun transition from Christmas to Valentine's Day always. I did some of that too. Thanks for visiting and following back. I've enjoyed all your lovely craft ideas on your blog as well!